Jonathan Foo collects his Man-of-the-Match prize after his unbeaten 70 against Antigua and Barbuda Master Blasters. 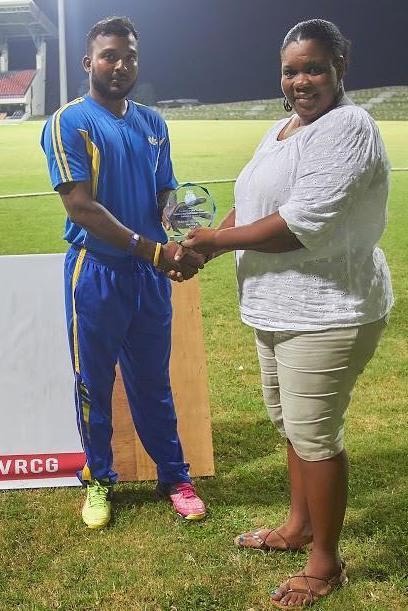 The Leon Johnson led Guyana T20 team, participating in the ongoing Antigua and Barbuda Independence Cup, are all but certain to play in Saturday’s after notching up two wins and a loss from their three completed matches in Antigua. 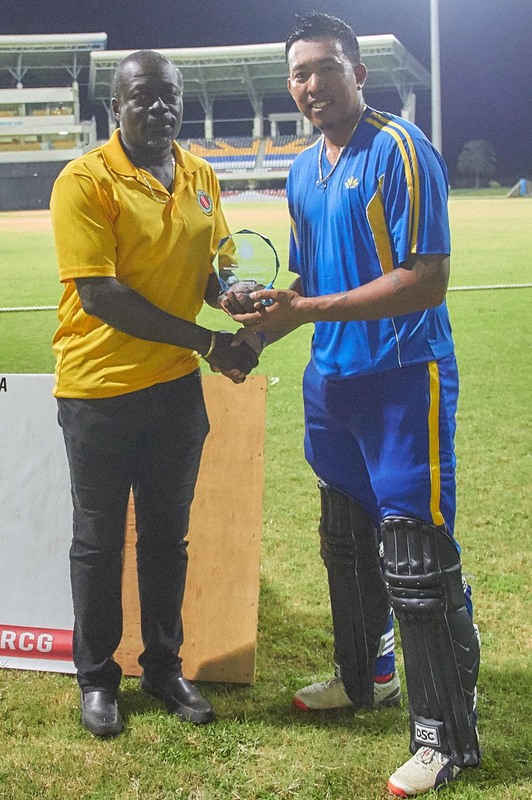 Guyana, playing in the second match of the tournament, lost to Jamaica by 50 runs before returning to dominate the Antigua and Barbuda Master Blasters in their following two fixtures. Last Saturday, Jamaica, after winning the toss and choosing to bat, compiled 179 for six from their 20 overs. Skipper Chadwick Walton led the charge with 31 while Guyanese Trevon Griffith (30) and Fabian Allen (29) contributed meaningfully to the total. Veersammy Permaul (1-24), Keemo Paul (1-25) and Steven Jacobs (1-27) picked up a wicket each from their full complement. Guyana, in reply, reached 129 – 8 when their overs ran out. Paul returned to score 35 while wicketkeeper/batsman Anthony Bramble made 33. Christopher Lamont led the Jamaicans in the bowling department, capturing three for eight to stifle the Guyanese. Guyana, however, bounced back to take their next two matches played on Sunday and Tuesday last against the Master Blasters and are on course to book a place in the finals. In match three Guyana, led by an unbeaten 70 from Jonathan Foo, cruised home against the Antigua and Barbuda side by four wickets. Antigua and Barbuda after winning the toss and batting managed 170 – 5 from their 20 over. Major contributions came from Orlando Peters who carved out 54 inclusive of three fours and two sixes while Kerry Mentore posted 43. Seamer Romario Shepherd captured 3 – 31 for Guyana who then romped to 171 – six. Foo took charge with unbeaten 70 while Skipper Johnson made 34. West Indies fast bowler Alzarri Joseph took 3 – 26 while Mentore returned to claim 2 – 45. Coach of the Guyana team, Esuan Crandon, said the plan was to bat through Joseph and Rahkeem Cornwall but go after the other Antiguan bowlers. “We knew that Alzarri was the trump card for them along with Rahkeem Cornwall but Rahkeem didn’t have a good night and so that made our job a little bit easier. We backed ourselves to score 10 or 12 runs in the last two or three overs on the other bowlers they [Antigua] have,” he was quoted as saying in the Daily Observer. Despite the threat posed by the two Windies players, Crandon said his players were always confident they would successfully chase the daunting total. The Islanders then suffered an even heavier defeat in their final match and are in danger of qualifying for the finals after winning the opening fixture against Jamaica. After winning the toss and deciding to bat, the Master Blasters were limited to 137 – 9 when their overs ended. Devon Thomas was the mainstay of the innings scoring 46 a knock which included two fours and four maximums. Permaul (3-35) and Paul (2-28) did the bulk of the damage for the Guyanese who cruised to 138 for three in the 19th over as Johnson stroked 42 while Robin Bacchus (34) and Chandrapaul Hemraj (31) got among the runs and completed the seven-wicket pounding. Henry claimed 2 – 24 bowling for the home side. Guyana was set to take on Jamaica in the final group match last evening and are likely to once again do battle against each other Saturday’s final.